I was recently reminded of an emotional truth. I like to think of it as my dog Maggie’s final gift to me. I lost Maggie recently. By “lost” I mean I ended her life. I can honesty say it was the most difficult thing I have even deliberately done. “Maggeroni” was amazing, nearly fifteen year’s old; way older than the oldest age shown on the dog years-to-human years conversion chart at her Vet’s office. According to that chart, big dogs don’t get to be Maggie’s age. So in recent years I made it a point to be grateful for every single day she was still with me. I kissed her more often and actually told her how grateful I was that she was my dog. She just loved me back and let me bury my face in that soft thick ring of fur around her neck. I prayed that when her time came, she would just naturally slip away. But that was not to be. I first met Maggie on New Year’s Eve day, 1997, in the “green room” of a morning TV talk show . She was nine weeks old and looked like a chubby white bear cub. I had been invited on the show to talk about emotional eating. She was there to be adopted. I commented on how cute she was and before I could blink, the “adopt-a-pet” lady had Maggie on my lap. And that was that. By nightfall, we were family. She was scary smart; one of those dogs who knew most of her toys by name. People said they had never seen a dog with such an expressive face. We always knew what she was feeling. And she was fiercely protective of me. She came to work with me every day when I ran my binge eating disorder treatment center. When I moved to my home office six years ago, she spent every day by my side, often right next to my desk chair. She was a wonderful companion. After me, the dog park was what she adored most! See that smile? People said, “You’ll know when it’s time. Your dog will let you know.” But Maggie did not tell me anything of the sort. This past year her head and heart were still fine. But her hips and legs were failing her. We had delayed the inevitable through a year and a half of holistic care; acupuncture, supplements, and anti-inflammatory meds. But those treatments were no longer working. The quality of her life had diminished, significantly and consistently. She had lost twenty five pounds since the end of 2011, but she still seemed to love being here. Her final week she was not eating (except treats, of course, which were never turned down), and she was having a tough time getting outside. Both her regular and holistic vets said it was time. After much soul searching and many tears, reluctantly, I made a plan. I decided she would pass away in her own bed, in her favorite spot, in our home, after eating a whole bowl of her favorite treats. 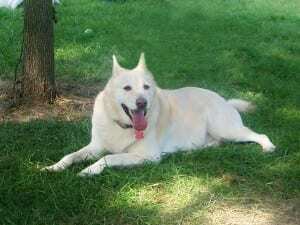 But moments after she was euthanized, I felt this overwhelming sense of guilt; like I had somehow betrayed her. She did not go peacefully, as I was told she would. A week later, I was still having trouble shaking the feelings. Determined not to turn to emotional eating to manage my emotional pain, I got some help. I knew I needed to talk this through. My Vet had mentioned a Pet Hospice program in my city called Angel Paws. I went to the website and learned that coaching was offered to help people deal with the loss of a beloved pet. I scheduled a phone session. After getting some background, the coach asked me to identify the actual thoughts that were driving my feelings of guilt and betrayal. My mind immediately went to a conversation I’d had with my next door neighbor the day before Maggie’s last day. When I told my neighbor of my plan and asked if she wanted to say goodbye to Maggie, she got very upset with me, challenged my decision, told me it was not Maggie’s time to go. She said she could not talk to me about this, went inside and slammed her door. That conversation kept playing over and over again in my head. Then the coach asked me to recall the thoughts I had had that lead me to decide it was time to help Maggie go. I easily recounted the consults I’d had with Maggie’s long term Vet and the holistic Vet who had been treating her with acupuncture. They had both seen Maggie within days of my decision. I also recalled the third opinion I’d gotten from the mobile Vet who came to our home on Maggie’s final day. As the hospice coach pointed out, in the days after Maggie’s death I had been choosing only to focus on the conversation with my opinionated neighbor, not on the conversations with the dog experts who actually knew Maggie’s health status and gave me educated, humane recommendations. In my grief, I’d forgotten that I get to choose my thoughts. I was too sad to remember what I already knew; that my thoughts drive my feelings. I, and I alone, give my thoughts power. When I chose only to replay the conversation with the neighbor, I was driving my guilt. I was not thinking about or remembering the reasons that lead me to humanely and compassionately end Maggie’s suffering. I did it because I loved her with all my heart! My guilt lifted. I did not betray my Maggeroni. I loved her! I loved her enough to do what I needed to do, even though it was the most difficult thing I had ever done. I still occasionally feel that guilt come back. When it does, I consciously choose to shift my thoughts. I remember how much I loved her and how I wanted her to be free. The following is a pledge from Dr. Linda Bacon’s groundbreaking book, Health at Every Size; The Surprising Truth About Your Weight, reprinted here with her permission. I thought making this Pledge could be a wonderful way to begin this very weekend. What do you think? Today, I will try to feed myself when I am hungry. 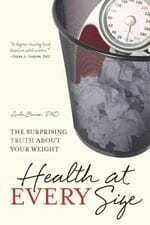 Excerpt from Health at Every Size: The Surprising Truth About Your Weight © 2010 by Linda Bacon.